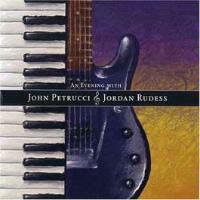 This is actually a reissue of an out of print disc featuring Dream Theater's guitarist extraordinaire John Petrucci in duet with their keyboard wizard Jordan Rudess. There is, without any surprise, some great musicianship on show here. The album features a lot of excellent instrumental work and intriguing compositions, sure to please both fans of Dream Theater and of instrumental, thinking man's music. The only real complaint here is something that I have expressed in regards to several other albums. Currently there seems to be a growing trend in progressive rock to lump all the mellower material together and all the harder material together. This is precisely what they do here. While I can see that perhaps they perceive it as a way to grow the intensity throughout the disc, I think that it tends to make the first section of the album lag, and feel way too unchanging. Indeed, if you put a mellow song right before or after a harder one, the contrast causes both songs to feel even more sedate or more rocking, respectively. I don't know, but I really think this disc would be a better listening experience had they put a couple of the hard rockers in early on the album rather than right at the end. Coming in with a slightly dissonant acoustic guitar, this solo quickly becomes very dramatic, and a bit flamenco sounding in texture. Eventually Rudess joins in on piano, and a frantic part jazz, part classical jam erupt. This carries through and the tune resolves into a more melodic, song-like segment. It eventually drops back to just piano, allowing Rudess to take us to new emotional heights. Petrucci eventually rejoins him on his acoustic, but only for short bursts. The flamenco sound is again prominent here. This is a dynamic and evocatively powerful composition. They even throw in a lounge lizard type slow jazz segment. This one starts with Rudess' piano, which plays for a while by itself. After a time Petrucci's chordings enter, and the cut takes a nice verse type melody. The change it up after a time with a bouncy sort of jam. Rudess is all over this one, tickling the keys into frantic patterns, while Petrucci holds down a steady rhythmic patter. Then it's John's turn to show off, laying down slow, but powerful electric guitar soloing that call to mine a bit both Al Dimeola and David Gilmour. This really smokes as he increases both the speed and intensity. After this it drops back to just Rudess running playful melody lines, then Petrucci joins him with chords later. The audience gets involved here, at times holding down the rhythm with hand claps. Petrucci finds another opportunity to soar later, chewing up the fretboard. It dissolves into near chaos to end. Folky acoustic guitar chords start this, and Rudess comes in with very Wakemanesque piano work. The cut becomes a bouncy excursion, jumping around in entertaining patters. The two explore the melody it takes on new and exciting patterns. This is quite an evocative and strong piece. Rudess gets very intricate in his neo-classical stylings at times. It also gets quite frantic at points. Mellow piano stylings create the familiar melody line to begin this. Petrucci joins in shortly, working his fretboard mage languidly over top. This doesn't wonder far, but is a pretty and comfortable respite. The guitar man begins this one, but is not alone for long. It starts quite slowly and Rudess lays down intricate lines over top of Petrucci's patterns. They begin to build it up quite organically. They don't move far from the roots of the piece, though, instead simply working their way over its themes, intensifying and expanding on them. Petrucci hits the electric after a while, scorching out the patterns. The interplay between the two men gets quite intense here. They drop back to mellower textures later, and maintain these jazzy styling through for quite some time. Eventually, though, they pull the intensity back. A mellow, but quite intricate intro starts this. The men play with these themes for a time, running them through, then dropping it way down to start building it up again. This is a beautiful and dynamic piece. This one has a more rock and roll feel than a lot of the stuff covered on the album. It is not bad, but by this time it's all starting to feel quite similar. Still, Petrucci gets in some solid solo time. Now this is a well-needed change of pace! Hard-edged rocky guitar patterns start this jam. Much of the opening segments of this cut is a screaming guitar solo. Only late in the piece do they drop it down to music similar to the rest of the album. Still Petrucci makes a point to scream out over top of this. This number is a nice bit of variety from the sameness of much of the album. Seeming to have found their rock roots, they continue forth here with a harder edged fast paced number that really smokes. This frantic jam is a stand out here. Another frantically paced screamer, why couldn't they have worked these in throughout the set instead of saving them all for the conclusion?